I had just returned from my holiday a few hours before, and was making my way through a mountain of work and blog related emails. Some were opened, some were deleted, and others were saved for later. But this one email stood out. As I read Sandrine’s email, it seemed like the whole world went silent as I learned that her baby Lucia was born premature at 29 weeks + 4days. After a courageous 51 days spent in the Neonatal Intensive Care Unit (NICU), Lucia heartbreakingly passed away on 10 November 2015 after 51 days fighting. In her email, Sandrine explained how that to help her come to terms with the loss, and to make sure Lucia’s life mattered, she had put together a guide for other parents in a similar position to read following her experience in the NICU with her daughter. As any frequent readers of this blog will know, I tend to wear my heart on my sleeve. I am very open and honest, and I also get great pleasure out of helping people. After reading Sandrine’s email, in all honestly, I wasn’t quite sure what to do. I did not know how to help her. The reality is that I can honestly say that I can’t imagine any greater pain than losing your child. I would be a mess. In the face of devastating loss, I feel that what Sandrine has done out of her heart to impart her knowledge on other parents is incredibly admirable. I wish I had the power to bring her daughter back, but I don’t. The only way I can help Sandrine is to help spread awareness of her guide by sharing it with you. If you know a parent that may benefit from this guide, please do pass the links forward. And for Sandrine, the mother of baby Lucia, this post is for you – you strong, brave, inspiring lady. The Survival Guide For Premature Babies In Dubai is written and produced by Sandrine Piedras – a French national who has been living in Dubai for five years now. 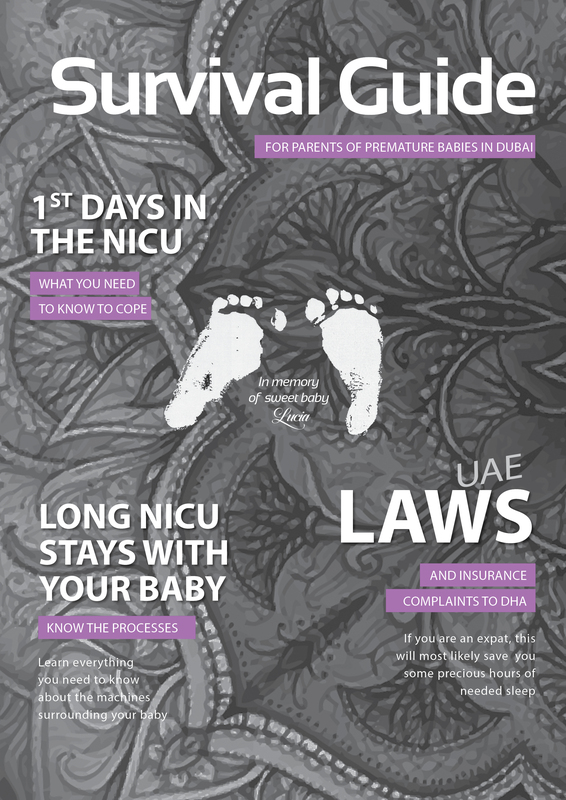 It is available to read on Sandrine’s blog – NICU Dubai – and for download and print from this link. My baby was born premature at 29 weeks + 4 days in Dubai Mediclinic City Hospital. She was diagnosed with and IVH (intra ventricular hemorrhage) grade 4, the worst scenario with a brain hemorrhage. After three weeks in NICU, a mum next to me opened up and explained to me some tricks: when to really panic when the alarm of the monitors go off, etc. I made it my mission to go see other mums and explain to them when to panic or not to, where to buy nursing tea, where to find the nearest restroom, where to pump etc. I truly found friends for life in this NICU. I created a WhatsApp group and would talk to every new mum entering the NICU. And we also discussed the need to have a welcome guide – a document explaining to new moms what to expect, what to do, what kind of machines they would find around they baby etc. So I began writing all that I could think of while I sat next to my daughter in the incubator when she was asleep. I could not talk to her or touch her because stimulation (noise or touch) could trigger seizures. So I wrote. It was only one week after she died, after 51 days in NICU, that I decided to write all my notes down and make a real document out of them. I asked some mums to help me with it and they wrote three of the pages included in the welcome guide. It was hard to write it at first, but I wanted my daughter’s life to matter. I wanted to help other mums new to the NICU world so badly. So it kept me going. It was part of my own personal therapy. Helping others. It had helped me through the NICU experience, and it helped me after NICU. Coming back at home, with the baby room prepared and ready, felt awful. You feel empty. We had lost our baby. We won one battle with the insurance, but we had lost the war. The scar reminds me every morning of my lost child. But my guide helped me stay focused. To have a purpose, a mission…and now that the job is done, it needs to be shared! You are not alone when you enter the NICU. I hope the guide can really help you navigate this brand new world you are entering. I just hope that Lucia lives through this guide and that she can help other moms like me.